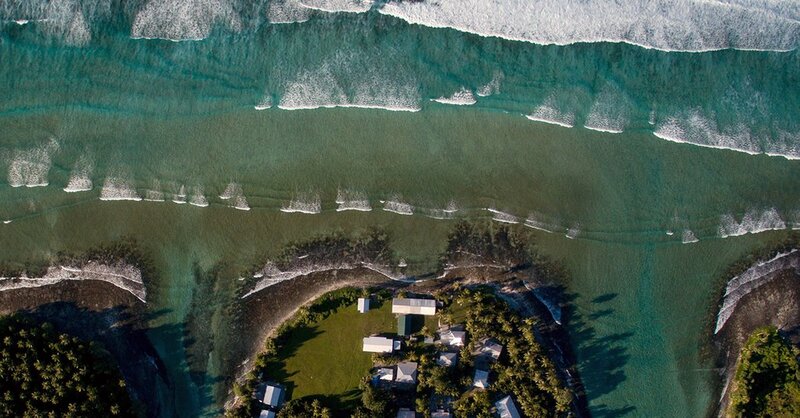 Waves rush onto beaches and beyond around the Marshall Islands, located in the Southern Pacific Ocean. In recent years, the islands have become some of the first landmasses to fall victim to rising sea-levels, potentially creating the world's first climate refugees in as few as twenty years. Photo courtesy of the New York Times. As one who’s constantly flipping through news apps online, watching the news on television, sharing perspectives, and the latest stories with friends and family, the world’s issues maintain a loud, constant presence at the front of my mind for a good portion of each day. In light of the short window between now and Earth Day, I knew it was time to voice my opinion on a topic that I hold dear to my heart. A common theme in virtually all of news segments that pass through my mind are tied to politics, or an area similar such as relationship between world leaders, rising and falling tensions, and wars. As vital and pressing as these issues are to average individuals and power-playing politicians alike, a constant message nags in the back of my brain like a hangnail, or the squeaking hinge of an old door. Where is the same vibrant, headline-worthy conversation on environmental issues? As climate change continues to ravage our planet each and every year, the widespread vocal postings, article publishings, and soundbites on the topic have still not materialized. Temperatures are rising, glaciers are melting, and even the course of rivers are shifting. As communities from high in the Andes mountains lose their water sources, and the residents of the small, steadily flooding islands of the South Pacific take on too much unwanted water and prepare to be the world’s first climate refugees, the mass media still neglects to cover these issues as highly as they would a presidential scandal or an airstrike. As the atmosphere traps more and more carbon emissions, turning the planet’s weather systems into an unpredictable force of mystery, world powers such as Canadian Prime Minister Justin Trudeau support pipelines and American President Donald Trump allows climate deniers to run the country’s Environmental Protection Agency, both actions that will lend extreme growth to the already enormous world carbon emissions count if left unchecked. Are these certifiable scandals not equal to President Trump’s tweets or a similar political event that would garner international coverage? Still, the media does little to bring these important issues to light. So here’s my question: is it time for mass media to push one of the world’s largest, and yes it is one of the world’s largest, issues to the forefront of objectively important news coverage? The answer is an overwhelming yes. In the meantime, there are many ways average individuals can contribute to spreading the word, and fight for change outside the mass media. The following guide provides all the information one would need to get started.